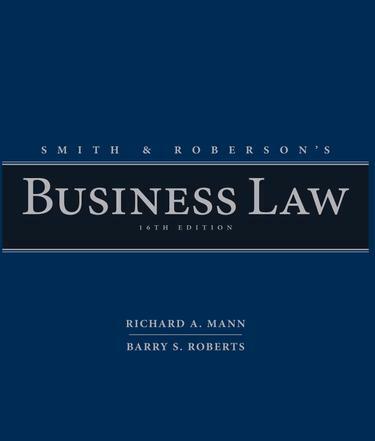 Mann, Richard A.; Roberts, Barry S.
The most complete, credible, and authentic business law text available, the Sixteenth Edition of SMITH & ROBERSON'S BUSINESS LAW by Richard A. Mann and Barry S. Roberts continues a long tradition of accuracy, thoroughness, and consistent coverage of the latest issues and emerging trends. This updated classic delivers a comprehensive, detailed presentation of business law that covers all topics included in the business law section of the certified public accountant (CPA) exam. In addition, this text covers the legal responsibilities and liabilities of accountants section and the corporate governance portion of business environment and concepts section of the CPA Exam. The cases--located at the end of each chapter--offer an excellent mix of landmark and current decisions and are edited to preserve a large portion of the language of the court. Proven, comprehensive, and completely up-to-date, this trusted and thorough text will challenge and engage your students--and ensure they leave your class with a solid understanding of modern business law.